Is Aldwych Tube Station haunted? 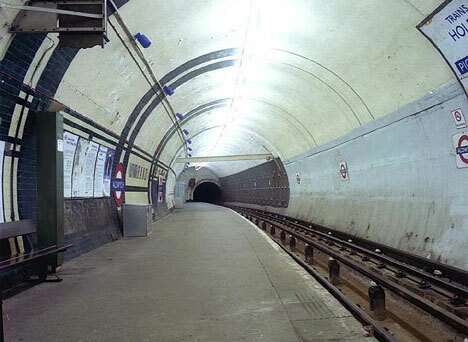 Aldwych Tube Station was first opened in 1907. The line was originally part of the Piccadilly line and with it being so close to many West End theaters, it gained the title of the "Theater Line". Makes sense! The station itself was built on the site of an old London theater - the Royal Strand, which was demolished in 1905. During the Second World War the line was closed and the tunnels were used as an air raid shelter and also to store national treasures from the British Museum, including the Elgin Marbles! On 30th September 1994 the line was closed because the cost of refurbishing the lifts at the station was deemed to be too much. The line however, lives on and is used by TV and film companies as a working set of an underground station. Ever see the music video for "Fire starter" by The Prodigy? Yup, that's where it was filmed! There is a tour held of the station which takes visitors around the eerie tunnels and silent back rooms. Many of the stations earliest features are still in place, such as the lifts built in 1907 which the sheer site of is enough to put the someone in the mind set of the era. Visitors to the tunnels have reported countless experiences of paranormal activity from being touched by an unseen individual to having the feeling of someone barge right past them as if a visitor from the past were about to miss their train. Whispers and the sounds of peoples voices from empty rooms are known to be common, but the actual words can never be made out. If your a visitor to london and a fan of the paranormal then this is definitely one location you simply must have a look at.